Despite everything I have had published in magazines this is my first book. Well I contributed to it, mainly chapters 14 to 17 the hardware projects. My thanks to Sean for inviting me to contribute. Writing a book is a rather different experience than writing for a magazine. Withe a magazine once you submit the copy you never see it again until it is on the printed page. With the amount of checking this has been subject to my hope is that it is error free. Anyway i hope you enjoy it, it’s available from all good book shops, and a number of rubbish ones as well. Sean has done a great job of describing everything you need to know to get your Pi up and running, and also how to start programming it in Scratch and Python. There is also a section on what to do if things go wrong as well. 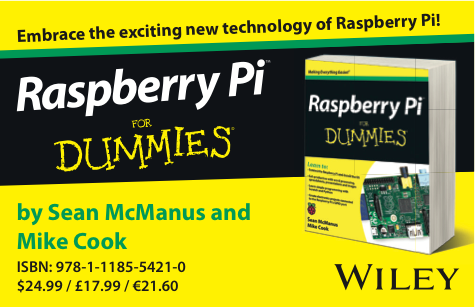 Sean has much experience in describing things simply for beginners, check out his other great books. Then I come along and show you what you can do to extend the reach of your Pi into the physical world. This requires a combination of hardware and software and I have used the Python learnt in the first sections of the book, to do this. So once some basic theory is dealt with I show you how to make a number of projects. On this web page I just want to point you at some of the hardware projects to give you an idea of what to expect. There are many ways to get at the GPIO pins on a Raspberry Pi. In fact there are two such projects on this site. However they both require that you put solder to metal. 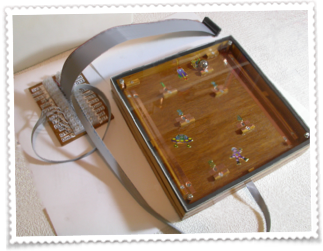 The breakout board in this book can be made without soldering anything to anything. All you need is some ribbon cable, an insulation displacement connector, a vice and some chock block connectors of the type you use for wiring up lights. This allows you screw connection access to the GPIO and is a great platform for your projects. Normally when it comes to doing projects you need to solder, but for this first major project in the book I have devised things so that there is no soldering involved. It is a unique game devised especially for this book. It is similar to a marble maze game where you have to manoeuvre a ball around a playing area by tilting the box. However what makes this one different is that the Raspberry Pi can sense when the ball reaches certain locations. You have to visit each location in turn and avoid touching the sides to complete the countdown and to blast off. Each location also triggers a sound effect from the Pi which you can customise to using your own voice or anything else. Great fun for group play. This is my take on the traditional sequence remembering game. A sequence of colours are displayed on lights and the name of the colour is spoken. You have to copy those by pressing switches. If you are successful your reward is that an extra colour gets tacked onto the sequence. There are two versions of this game described in the book, an easy to make game, and the deluxe version shown here. The great thing about this game is the unique low cost way I have made the illuminated switches. I am using a variation of the technique I developed here for one of my Arduino projects and it has a lot of potential for other projects as well. This is a way you can get analogue, or continuously varying signals into your Raspberry Pi. In electronics a ripple is a voltage variation usually sitting on top of a steady voltage, as this project measure small variations or ripples I though it was a good name. It uses a converter chip attached to the two I2C lines of the Raspberry Pi’s GPIO connector. It is quite simple to build and it opens up the door for all manor of sub projects, some of which I cover in the book. It also allows you to output an analogue signal as well. Here are some of the things you can do with the Raspberry Ripple. One simple thing you can do is to read the position of a potentiometer or pot as electronics people call them. If you are not familiar with this it is just the sort of thing that is used for a volume control on a radio. However, using a pot you can interact with a program running on the Pi and it gives you an instant way of control. This video shows some of the things you can do with a simple pot and the Raspberry Pi when you write in Python. With some electronic components the graph of voltage against current is an important parameter this part of the book shows you how set up the Raspberry Ripple as a simple curve tracer for LEDs, resistors and diodes. 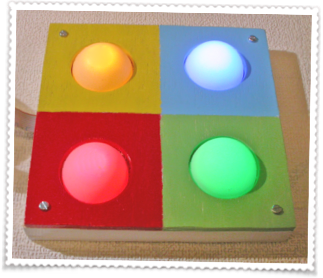 Turn your Raspberry Pi into a Steve Reich like composing tool, control the music with either pots or waving you hands above light sensors. Measure temperature by adding a temperature sensor to the Raspberry Ripple. Draw pictures on the screen by twisting pots, just like a mechanical version of a drawing toy who's name escapes me for the moment. Using light sensors play a simple four note instrument. This is just a small list of component suppliers. Consider the postage costs when purchasing, it might be cheaper overall to not always get the cheapest parts but to use fewer suppliers.